Hello again! Now that you’ve introduced your awesome brand to potential customers, we’re going to talk about one of the most important types of emails in the series: the lead nurturing email. 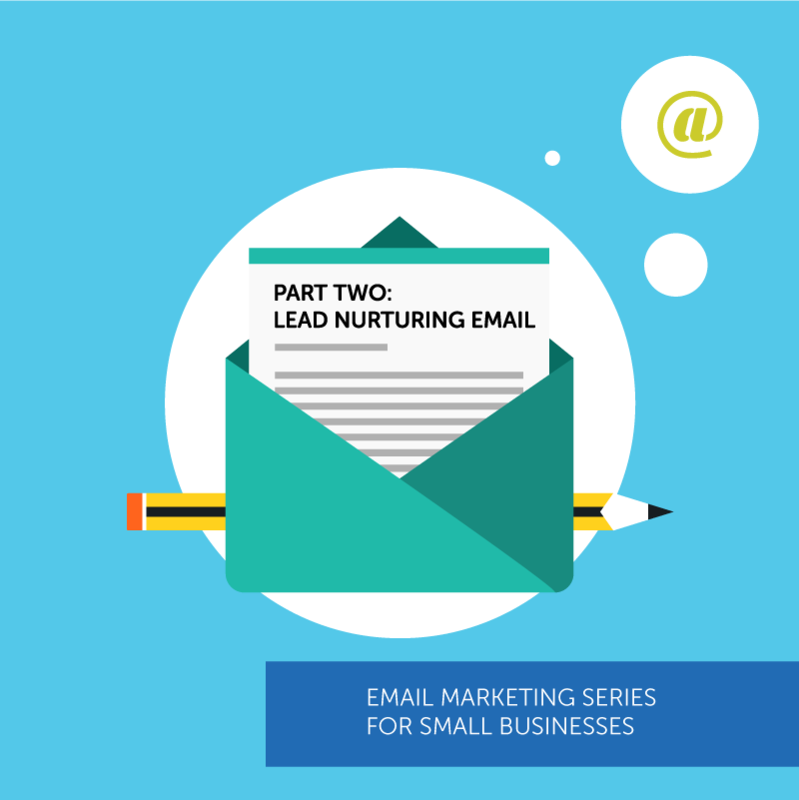 We talk a lot about the value (and necessity) of lead nurturing in your inbound marketing efforts, and email is a huge part of that. Now is not the time to be complacent. These interested parties are leads and prospects. They are not yet paying customers. In marketing and selling, what matters most is making the sale. What does it do for you if you get leads galore but never make a sale? Today, let’s talk about using email marketing to nurture leads, build momentum that drives subscribers toward the sale, and bridge the gap between opt-in and winning a sales appointment. You Want To Go Out Sometime? Business is like dating, in a lot of ways. In email marketing, your reader’s decision to join your list is like saying “Yes” to a date with you. Lead nurturing is the courtship. You’ve made some progress in the relationship, but you still need to move it further along before you make things official (ask for the sale). So engage in rapport with your prospect to deepen the bond, build trust and win them over. Keep this in mind as you craft your lead nurturing emails. You wouldn’t go on a first date (the email list opt-in and intro email) and then pull out a big, shiny diamond ring and pop the question (at least we hope not)! You don’t want to rush it. You spend time in the courtship phase of the relationship to make sure you’re on the same page. Likewise, you don’t want to immediately go for the sales appointment right after the email marketing relationship begins. So don’t send emails during the nurture phase you should be saving for later. For example, don’t send free trial offers yet. Send low-key emails that offer value, educate your readers and build trust. Send useful content that helps them accomplish a goal related to your product without having to actually buy your product. For example, let’s say you sell lawn care and gardening tools. You could send your subscribers free, valuable “green thumb” tips. This would boost their level of trust (a key requirement for building a successful relationship). Keep in mind that it can take a while for them to go from new lead to hot prospect. But emails like this and the goodwill you create from giving valuable free information with no demand for anything in return, can build up TOMA (Top Of Mind Awareness). This is important. Why? When they do decide to take the next step in the buyer’s journey, you want them to think of you first, before any of your competitors. Even though we are discussing individual emails in this series, most likely the lead nurturing stage will require multiple contacts. And even though you don’t want to be overly salesy, there will come a time when you need to send emails designed to get them to take action. That email is a topic for another article. Next, let’s take a look at a sample lead nurturing email of the sort a small business like yours might send. Because you’re interested in website redesign, I imagine you’d love to optimize your social media presence as well. Since the holidays are just around the corner, I thought it was the perfect time to send you our Holiday Social Media Posting Guide. Download your copy now. I hope this complimentary resource helps you put a social media plan in action for the holidays. p.s. Have any questions I can answer for you right away? Send me an email at bob@rocketmarketing.com or call us directly at 555-633-2727. Remember that the lead nurturing phase of your email marketing needs to be heavy on the giving of value and the building of a bond of trust and rapport and light on the persuasive calls to action – that is, until your lead makes and indication that they’re interested in your product or service. Successful lead nurturing is an integral part of marketing success. If you want more information on how to generate leads and nurture them into customers, our Lead Gen 101 course is a great resource.